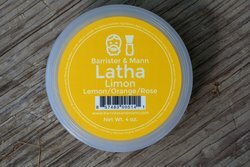 "I never quite know how something from Barrister and Mann will smell, and I took a risk on this soap based off of all the great reviews I read of older releases. This smell did not disappoint. Its extremely musky at first but then mellows out into a musky/sweet vanilla. 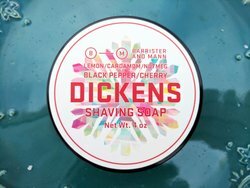 The soap performance is just as good as any of Barrister and Mann's other soaps, and it comes with great customer service. I had broken the lid on my night music soap shortly after buying it. After contacting them through the website I had a replacement list in a few days. I high recommend this soap and any of their other soaps, they will not disappoint." "8 days growth. First shave with first snow. I really like the scent, l wish it was a tad stronger. Shaved with a razor blade with 8 shaves on it, way past its prime. So this was a good test for the soap. First pass lather really good, second and third pass lather was thin. I blame myself for the lather, l was in a hurry. Here is the kicker, the blade was dull, pulling slightly. After the shave my face felt fantastic as if I used a new blade. No nicks or irritation. I credit the soaps performance for that. 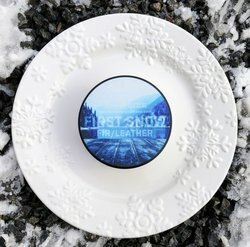 I used proraso after shave balm instead of the first snow after shave splash. I will use the splash for my next shave." 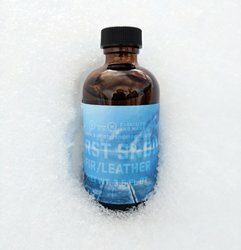 "First Snow is a great soap true to it's name. A fresh masculine scent with just enough menthol cooling. Top notch lathering and performance on top of a great clean scent." "This aftershave has that traditional old barbershop fresh scent, but in a very subtle way. When I wear it, I have noticed that my friends pay a little more attention to me, and often sit a little closer when we get together..."
"I have not personally used this, but the person I got it for LOVES this aftershave! Anything B&M is quality...top notch ingredients makes for a great product"
"The puck smelt good once opened but once it was put through a quick light bloom the scent really opened with citrus and beautiful light wet Moss notes, and once lathered there we other earthy and floral notes and they last all three passes and right up till the aftershave took over! The later was creamy and slick! No issues at all! Though it was a very thirsty soap! Keep adding sprinkles of water! It helps!" "After going through my first Cheshire as one of my B&M Favorites (along with Seville, Bay Rum and Rhapsody)... 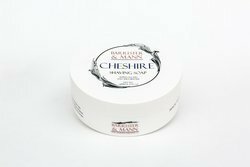 I missed the comfort of the smell of tea and lemon in the early morning and nothing works better than a new tub of Cheshire..of all my soaps, It is my favorite and most comforting. Thanks"
"Nice scent. Aftershave does its job well, just like all B&M products." "This is another great hit by Barrister and Mann! As always it performs beautifully. The smell is like being in a pine forest. I love it. This will be reordered again when it comes back into season. Thanks for making the best shaving soaps and scents on the market." 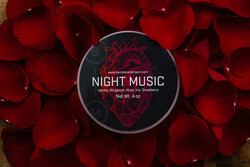 "I've used and smelled a lot of soap in the years I've been wet shaving, and Night Music is without a doubt a shining star that stands out from the rest. Never has there been a scent so luscious and seductive, just the right amount of vanilla and musk with a touch of strawberry to sweeten it up a bit. Do yourself a favor and grab the soap, aftershave, and EdT any chance you get." "This scent was my first from B&M, I really liked it." "This is a unique scent, well, you can say the same for all of B&M products. This scent will definitely be very Holiday like, and perfect for celebration time. super sweet and strong as I love them!!" "Smells even more powdery than the soap. It smells like what I would like to think the original smell that they were aiming for was like. It's long lasting and is wonderful for smelling lavanille all day long." "Lathers up with ease and really perks me up with that excellent scent." "Absolutely great fragrance and lathers really nicely. Always look forward to pulling it out, and love the companion aftershave as well. Coffee and chocolate at first, drying to leather. My fiancée can't get enough." "Great aftershave performance and an even better scent. Perfect scent for wintertime." "This soap performs solid. I face lather and get a rich creamy lather with zero skin irritation. 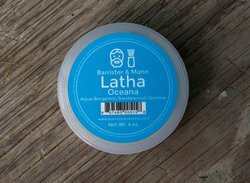 Provides a nice cushion and slickness for a smooth nick free shave, Barrister and Mann always comes through. A serious value for your money." "Great packaging, and scent. Right off the bat you get hints of pepper and cherries. Lathers and performs great. Only downside is I crave sweets after shaving." "I enjoy strong coffee scented soap and slashes and this one is my favorite! No latte foofy smells here, this one is all business." "Glissant base performs excellently as expected. You need less product than white label for an equally, if not better, lather. The scent is one of my favorite B&M scents, though it's not for everyone. The vanilla and musk are definitely more prominent in the splash or EdT (though they're also very vanilla musky). Just make sure you rinse out your brush well if it's a natural hair brush. Vanillin stains them like no other." "I guess I can see how the scent of this soap might be divisive, but personally I love it. I like the forward Iris, and anyone familiar with Grey Flannel will immediately recognize it as one of the role players. Here though, the Iris is the center piece, and rather than accentuating the floral, woody, grassy elements, Night Music takes the Iris and nestles it in a warm and sweet bed of vanilla and musk. The vanilla is easily recognized, but the other specific elements are either transparent or just generally unrecognizable to me, I don’t have the palate to tell which, but they definitely reach into the animalic and fruity. It’s a passionate scent, one quite appropriate for Valentine’s. Romantic, with a carnal, almost feral edge. I own a good deal of soap, and this one is one of my favorites." "Great scent that both me and my wife love. Beautiful design and packaging as usual." "I really enjoy using this in the morning. The citrus scent is just the eye-opener I need." "Amazing soap. 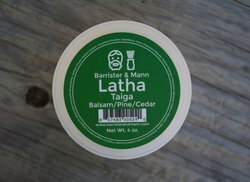 Preformed wonderfully, however the scent is polarizing"
"Loading and lathering is exactly what you'd expect from Barrister and Mann: top notch. The scent is perfect for the Christmas season: the smell of cherries and a hint of nutmeg is what I pick up the most." "This was a gift for someone, who told me to rate it 5 stars. I did smell the scent and it was like walking in the woods. It's a great scent. The load and lather is easy according to my friend." "Great soap and aftershave. Great performance and scent!" 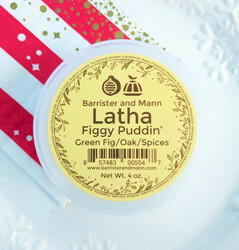 "The scent on this Latha line offering is sweet and warm. A scent that provides a really happy, uplifting start to the day. The performance is as one would expect from the Latha line. Easy to lather and providing slick lather that gives a superb post-shave feel." "I'm a big fan of this scent. It's very masculine without being overbearing." "Outstanding performance with the Latha Series! the smell is sweet, but refined, you definitely pick up the currant and amber up front with the sandalwood rounding things out. 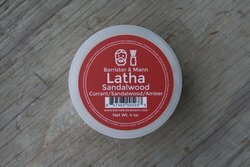 I will definitely be purchasing other scents from the Latha series! The soap lathered very easily (slightly thirsty as with all B&M) with outstanding up front and residual slickness!"